Dispensers in a choice of clear acrylic or injection-moulded styrene. 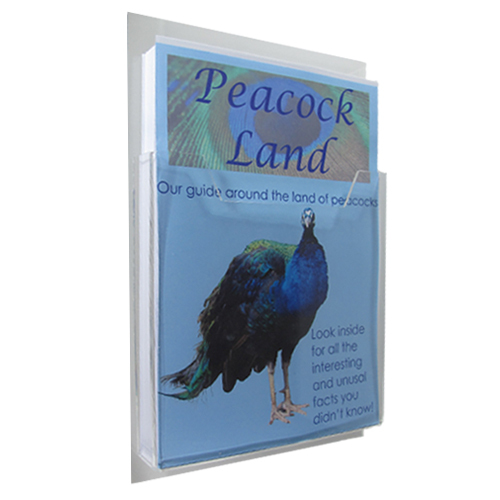 Made at widths to fit below standard sizes of poster holders in suspended displays, but can equally well be used with wall fixings. PLEASE USE THE DROP-DOWN BOXES ABOVE to view different options for this item (eg by altering the 'dispenser type'). Panels are in 3mm clear acrylic. Dispensers are either injection-moulded styrene taped to the panel or fabricated acrylic (made from 3mm clear acrylic and glued to the panel).